A relatively tranquil region providing high visibility and relatively few large carnivores. 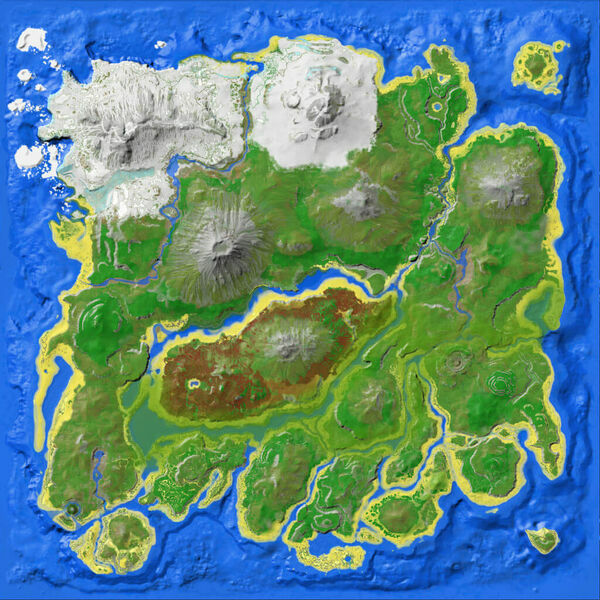 An excellent starting location for new players; the East Spawn locations are scattered through this region. The eastern edge of this region is a peaceful, idyllic coastline of sandy beaches, forests, and rolling hills. Raptors and hostile insects are the primary threats to new players, but Carnotauruses may also appear on occasion. On the western side of the region, along the river system on the interior of the island, more serious threats emerge. Spinosaurus fish these rivers, and are best given a wide berth. If you go near the lake you will often find many Compy. As the name suggests, shores. It opens out into the water, not always into the ocean, with about half of the SES based on inland rivers. It does partially protrude into the swamp, and narrowly misses the green obelisk (it was the blue obelisk until update 216.0). Fiber is quite common in the Southeastern Shores due to the many bushes. Stone can be found on the shore as the form of large rocks as well as little rocks on the ground. Wood is not so common but still there are some little trees scattered around the shore. Metal is rare in the Shores and can be found rarely in large rocks,and often in small stacks.